The absorption of a chromophore in monochromatic light is proportional to the quantity of the reacted substance, provided that the amount of chromophore taken up is proportional to the amount of original substance present. Quantitative cytophotometry depends on two laws of physics: Lambert's law and Beer's law, which state that the amount of monochromatic light absorbed by a material is related to both its concentration (Beer's law) and its thickness or path length (Lambert's law). 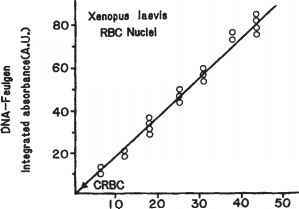 That is to say, microdensitometry (cytophotometry) is the measurement of the light absorption of objects under a microscope and can be used to determine the amounts of a histochemical staining reaction in individual nuclei to estimate the cellular content of substances such as DNA (12,16,64,65). Quantification of estimates of genome size (the C value) depends on having a reliable method to determine that the amount of Feulgen stain bound to the chromatin of a nucleus is directly proportional to the amount of DNA present. 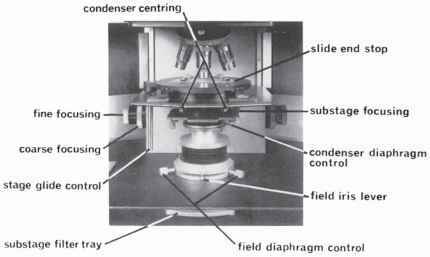 Microdensitometry is concerned with the precise measurement of light-absorbing components in microscopic preparations. Measurement relies on the interaction between photons at specific wavelengths and the chromophores (i.e., chemical substances such as the Feulgen-DNA dye complex that is contained within the nucleus of a cell). Loss of photon energy (absorption) or optical density (OD) results from the interaction of the insoluble stain reaction product with incident light. The transmittance (T) of the nonabsorbed incident light to a photosensing element in the system is used to translate the difference between the intensity of incident light entering the object and that of the light leaving the object. In fact, it is only possible to measure the transmittance of an object (12,64,65). Fig. 5. Relative photometric error as a function of specimen transmittance in cytophotometry. The percent error rises sharply as transmittance is increased and as density is decreased, so that counting of photons is most accurate between the range of 0.2 and 0.8 units of absorbance (A) or optical density (OD). At either extreme of this curve, the changes in percent error are nonlinear (see Note 10). object). Conversely, the relative error in counting photons transmitted through a high-density object (= low transmission) is also subject to considerable error (see Note 10). To minimize this inherent error in photometry, it is important that IOD values remain between 0.15 and 0.85 (i.e., the range over which the relative error is essentially 2-3%) (7,12,50,51,64,65). For substances that are uniformly distributed (pure amplitude objects, as in a test tube or a cuvet), there is no difficulty in determining valid IOD values. 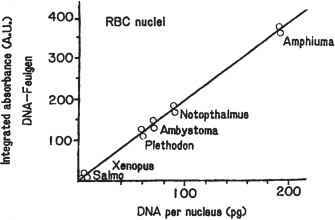 However, the absorbing material in cells, such DNA in a nucleus, is not normally distributed uniformly, giving rise to the so-called distribution error of cytophotometry (12,41,64,65), which, if uncorrected, yields erroneous results because of the nonlinear relationship between transmittance and absorption. One solution to this problem is to divide the object into a number of points (pixels), each of which can be regarded as uniform, measure the light transmittance at each point, convert each one to an absorbance, and then sum them to give the total absorbance of the object (i.e., its IOD). The use of either a scanning stage or a Flying Spot microdensitometer provides a feasible way to take multiple sampling of a field that can be summed electronically to yield IOD values for the objects of interest (12,38,41,65). By obtaining the relative integrated absorbance expressed in IOD units for populations of Feulgen-stained nuclei from several internal reference "standards"
of known DNA content (2,6,12,16) it is possible to establish reliable and reproducible curves to convert IOD values for "unknown" specimens into estimates of the amounts of DNA in picograms per nucleus to obtain C values for various species of Drosophila (see Table 1) or to estimate the number of multiples of the C value present in polysomatic cells of various Drosophila tissues at different stages of development (see Figs. 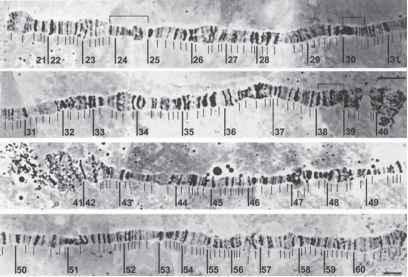 1-3) or from different genetic stocks (e.g., the otu mutants studied by King and his co-workers [20-22, 63; Chapter 6]). Representative standard curves over a wide range of DNA levels are shown in Figs. 6-8. 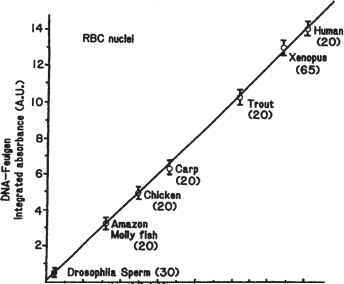 Erythrocyte nuclei in thin blood films of chicken (2.5 pg DNA per cell), rainbow trout (5.0 pg DNA per cell), and the African clawed toad, Xenopus laevis (6.3 pg DNA per cell) are very convenient and readily available reference standards to include with each set of slides to be measured using the Feulgen reaction for DNA. Feulgen-DNA microdensitometry measurements are taken both of the nucleus within an appropriate mask and, again, of an adjacent clear area of the slide. The difference between the two readings represents the transmittance (T). These readings for "object" and "background" are accomplished electronically by the densitometer to yield data displayed digitally in relative units of IOD as described earlier. A single-point measurement, of course, is not representative of the heterogeneous whole of a stained nucleus (the distributional error) nor does it take into account the variations in size of individual nuclei. It is necessary to obtain a series of point densities by scanning the whole nucleus (38,39,65). The necessary measurements of point densities of a nucleus are required to obtain valid data in IOD units obtained here by a "Flying Spot" instrument (Vickers M86), the scanning spot of which may be from 0.2 to 1.0 ^m, depending on the size of the object and the magnification at which it measures each point of its traverse in a raster pattern over the background and over the nucleus. With an instrument of this type, some 40,000 point density samples are accumulated within a 4-s scanning and integrating interval. Both scanning stage and Flying Spot microdensitometers require careful identification and selection of individual nuclei for measurement and both are time and labor intensive. It is very likely that genome size determinations in the future will employ Feulgen-DNA image analysis microdensitometry (IAM) (12). Modern technology using cooled charge-coupled device (CCD) cameras with a dedicated computer and appropriate software has led to increasing application of IAM as a rapid and reliable way to determine genome size and C values for a wide variety of plant and animal species. With a suitable microscope for identification of cells and the ability to select fields for the measurement of multiple nuclei simultaneously, these newer methods offer "accuracy, rapidity, and cost-effectiveness" for genome size determinations (12). This combination of features may very well lead to a resurgence of interest in the field of genome-size determinations. or hemolymph droplets. All values of density of background and object background are registered and shown as digital values on the display panels of the instrument. IOD values and the relative area of absorbing chromophore are stored in keyed files within the computer on disks and can be rendered as hard copy via a suitable interface to a dot matrix or other type of printer (12,65,66). Several major components used in the following procedure for actual measuring of individual nuclei are shown in Fig. 9. Once again, it important to emphasize optic and specimen cleanliness, which, in cytophotometry, verges on sanctity. 1. Turn the masking control knob to "Set" and carefully adjust the Kohler illuminator; place the specimen slide on the stage of the viewing microscope. 2. Select the correct wavelength, bandwidth, and spot size and scanning frame. 3. With the mask and/or specimen-stage controls, place the object within a suitable size of mask centered within the scan frame (reticle in left eyepiece). Then, move to a nearby clear (background) area somewhat larger than the mask size. 4. With the spot manual controls, place the scanning spot in a clear background area within the centered mask and focus carefully to get as sharp an image of the scanning spot as possible. Then, use the fine focus of the microscope to bring the object plane of the specimen to coincide with that of the scanning spot image. 5. Turn the masking control knob to "Scan." 6. Set 0 on the density meter (with photomultiplier blocked) and set background density to 0.05 with the "set" zero control. Set the gating meter to the green line. 7. Switch scanner unit to "Automatic." 8. Press "Integrate" button to scan. Record displays for density and area. 9. Turn the masking control knob to "Set." 10. With specimen-stage controls, move the object from the mask and substitute a clear background area. 11. Turn the masking control knob to "Scan." 12. Press "Integrate" button to scan. Record displays for density and area. 13. Subtract value obtained at step 12 from value obtained at step 8. The result is in arbitrary IOD units that are dependent on objective magnification and scan frame size. Conversion to absolute units may be accomplished using an appropriate stage micrometer, enabling simple comparisons to be made between results obtained at different magnifications or at different times using the same settings for the instrument. By establishing standard reference curves (see Figs. 6-8) and always carrying two or more reference standards with each set of "unknowns," results such as the somatic cell genome size or 2C DNA value for an "unknown" species of Drosophila from scanning microdensitom-etry can be stated in picograms of DNA per nucleus with a reasonable degree of confidence in its accuracy (2-4,12,16,25).